Amy Staats in Eddie and Dave. Photo by Ahron R. Foster. BOTTOM LINE: A campy telling of the genesis and rise of the band Van Halen. If you’re a Van Halen fan, and you’ve been dying to see the band’s story told onstage, you won’t want to miss Eddie and Dave. 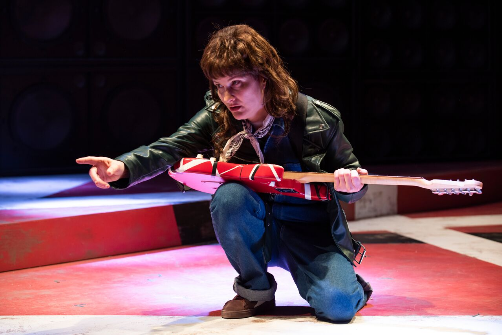 The play is about the ever-evolving and tumultuous relationship between Eddie Van Halen (Amy Staats) and David Lee Roth (Megan Hill). I, for one, am a sucker for the backstage stories of famous artists or works of art. It’s always fun to compare the mundane humanity behind eccentric personalities with the public image that they work so hard to craft. There’s something irresistibly charming about hearing David Lee Roth refer to Eddie Van Halen as Edward. The full name immediately shatters the rock star’s mystique and relegates him to another kid on the block with annoying friends and family who refuse to drink the Kool-Aid that we fans are intoxicated with. I did a little bit of internet research about Van Halen’s journey, and nothing in the play struck me as terribly outlandish or made up, other than the wink-wink style with which the story is told. If you’re looking for a sincere, emotionally-driven rendition, this is not it. The performances are campy and over-the-top, and the actors are having a wonderful time laughing at the ridiculousness of their subjects as they bring them to life. Staats stipulates in the script that Dave, Eddie, and Alex Van Halen should be played by women, and Eddie’s wife Valerie Bertinelli (played hilariously by Omer Abbas Salem), should be played by a guy. The use of drag heightens the camp of the show, and reminds us we’re not supposed to get too emotionally involved with the characters. Director Margot Bordelon maintains a sense of Brechtian alienation throughout the piece, which reminds us to laugh, have fun, and not take anything too seriously. Reid Thompson’s extensive set design is a collage exhibit that celebrates the heyday of the Rock era. Atlantic's smaller theatre space feels like a Hard Rock Café, with memorabilia lining the walls that surround the audience. Eddie and Dave is great fun, and fans of Van Halen will appreciate the light-hearted homage being offered here. If you’re not terribly versed in rock trivia, you may enjoy learning a few facts. I never knew that Eddie Van Halen, for example, was the featured guitar soloist in the Michael Jackson classic “Beat It.” But while you’re likely to enjoy the playfulness and comedy, those who prefer sincerity and pathos over camp might leave wanting more. After 95 minutes of laughing at the characters, I found myself at a loss for a larger purpose. The show is like a marijuana high: it’s good for a giggle, but when you come down, what are you left with? Eddie and Dave is by Amy Staats. Directed by Margot Bordelon. Set Design by Reid Thompson. Costume Design by Montana Levi Blanco. Lighting Design by Jiyoun Chang. Sound Design by Palmer Hefferan. Additional Music by Michael Thurber. Projection Design by Shawn Boyle. Fight Director is Mike Rossmy. Hair and Wig Design by Cookie Jordan. Stage Manager is Megan Schwarz Dickert. The cast is Vanessa Aspillaga, Megan Hill, Omer Abbas Salem, Amy Staats, and Adina Verson.